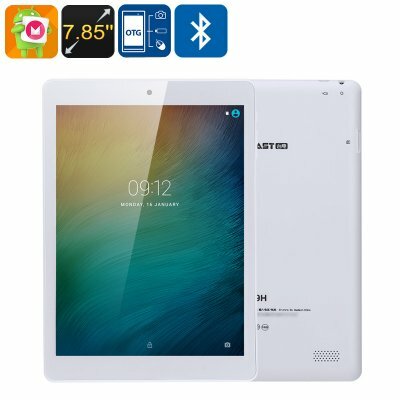 Successfully Added Teclast P89H Android Tablet - Android 6.0, Quad-Core CPU, 7.85 Inch Display, 3800mAh, Google Play, Dual-Band WiFi, OTG to your Shopping Cart. The Teclast P89H is a cheap tablet that despite its low price comes packed with sophisticated hardware. If you are looking for an affordable Android tablet that is capable if performing all basic tasks, this 7.85-Inch tablet is perfect for you. It runs on an Android 6.0 operating system. Thank to this, you’ll be able to enjoy all the latest software features available. Your tablet is guaranteed to treat you with a smooth and lag-free experience. You’ll be able to play basic games, watch movies, and browse the web. All which can be enjoyed on the Android tablet’s stunning 7.85-Inch IPS display. Within its sleek body, this cheap Android tablet holds a Quad-Core processor from MediaTek. This chipset has been clocked at 1.3GHz and is capable of producing enough strength to handle all the basic Android applications. Coming with 16GB internal storage and a 32GB SD card slot, this Android tablet computer features plenty of space for you to store your media. Simply head out to the Play Store where you’ll be able to download the latest games and Apps. With this Android tablet PC at your side; you’ll never have to feel bored again. The tablet’s beautiful 7.85-Inch display features IPS technology. Thanks to this, you’ll be able to enjoy deep vivid colors and extreme details no matter your viewing angle. By supporting 1024x768p HD resolution, it will treat you with absolutely breathtaking HD visuals. With this Android tablet, you’ll be able to enjoy your favorite media on the go like never before. In order to increase your mobile entertainment experience even further, this tablet PC supports OTG. This allows you to hook it up to external hardware devices such as a hard disk or game controller. With Dual-Band WiFi support, you’ll be able to browse the web at lightning speeds. Whether you’re at home or in the office, from now on you’ll always be able to stream movies and download files. Along with its front camera, this Android tablet PC is perfect for engaging in online calls with friends and family. A powerful 3800mAh battery lets you make use of all the features this tablet computer has to offer for hours in a row. The Teclast P89H Android tablet comes with a 12 months warranty, brought to you by the leader in electronic devices as well as wholesale electronic gadgets..